yep ~ I went there. It must be award season. 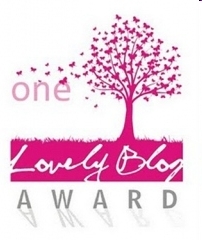 Thanks so much to Tara at ArtLoverMommy for giving me the One Lovely Blog Award. Stop by and check out her stuff. Awww, now I have a case of the warm fuzzies. Congratulation for your award …and for those beatiful sandals!